We took the highway in Judy’s Toyota truck for the short ride to the hospital. With the wind sweeping our faces through the open windows, I caught a whiff of beached alewives rotting along the shoreline, unless it was just the mixture of cigar butts and empty beer cans and the exhaust from Judy’s truck. We stopped at the only traffic light along the way, next to the Wesco station, and I watched a man with an old Ford pickup and a hitched boat fill up with gas as we waited. The Wesco was the only business open at that time of night, the canopy’s fluorescent lights putting him on display. I wondered what he would think if he noticed me staring at him from the passenger seat of a truck with a towel held to my head and a woman behind the wheel. Few women – if any, other than Judy – owned trucks, so it would have been easy to think I was letting her drive mine, something most local men wouldn’t allow back then, and so I worried he would know or be able to tell that I’d been subdued by the hands of a woman. At least her Toyota was small; nothing a northern Michigan man would own, but I leaned away from the window just in case. Luckily he seemed lost in thought, probably dreaming of the next days fishing excursion out on the lake, and wasn’t paying any attention to me. I almost asked Judy to pull into the station to get me some of the chocolate no-bakes they sold from a plastic bin next to the cash register, which I loved. They were as thick as steaks, loaded with sugar and a texture of pure genius, peanut butter with cocoa and oatmeal, soft and yet firm, the granules of sugar exploding in your mouth. Sweet heaven. They were the next best thing to a woman’s breast, plus chocolate. I always bought two whenever I stopped for gas, and then I could act disinterested in whatever Sally had made when I went home, since the girls didn’t want me to partake of their goodies anyway. Two of those no-bakes would make me feel delightfully sick – my only fix of sweetness – but the light turned green and Judy took off. Oh great Jim! 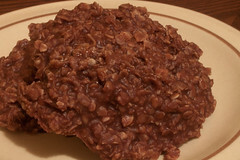 Now I have an insatiable urge to make no-bakes & devour them all!